Nexiq Technologies’ Nexiq USB Link 2 (or the Nexiq 124032) is a follow-up to the much acclaimed Nexiq USB Link 125032. Impressive as it is, the 125032 has nothing on the 124032. The hand-held scanner includes 30+ Page Companion Guide which explains how to configure, troubleshoot, & use your USB Link 2. Companion Guide also provides links to free legal & available diagnostic software. The latter supports heavier vehicles than its predecessor. It is also 5 times faster thanks to the powerful RAM that has been increased 16 times. And in case you’re worried, this is the original, genuine version of the scan tool. There are some counterfeits that are seriously lacking in functionality. Be sure to check that you’re dealing with the real thing. So what does the genuine Nexiq USB Link 2 bring to the table? Let’s look at the main features, shall we? 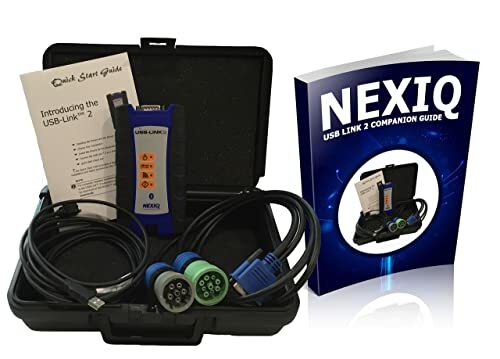 As mentioned already, the Nexiq USB Link 2 is more of an interface for installing diagnostic software. It provides the software and the vehicle’s systems a platform for communication. If you have it, together with the supporting software, you can diagnose a heavy-duty vehicle. So what software is it compatible with? Virtually all the software that run diagnostic tests for large vehicles. Examples include CAT Electronic Technician, Detroit Diesel Diagnostic Link, Hino eXplorer, V-Mac Service Tools, Volvo PTT, Cummins Insite and VCAD Elite Mack among several others. It also supports a number of Allison diagnostic software. With that software, you can diagnose the vehicle’s engine, instrument panels, ABS, transmission and many other systems. You can run the Nexiq USB Link 2 on a PC or laptop. It is compatible with Windows XP and any later version, whether it is a 64-bit or 32-bit. Well, it is not exactly a diagnostics tool but rather a hardware kit that can house diagnostics software. Basically, you need to install OEM diagnosis software before being able to run vehicle scans and tests. Once you’ve fed it with the software, Nexiq USB Link 2 supports several protocols for diagnosis of heavy-duty vehicles. The most notable are 3 CAN, Fault Tolerant CAN, Single Wire CAN, auto-bit rate detection for all CAN channels, ISO 15765, ISO 14230, J1587, J1708, J1850, J2534, ALDL and ATEC 160. In short, you can diagnose pretty much anything in a vehicle’s onboard systems and body. With its flexible configurations, you can use the Nexiq USB Link 2 to quickly access a vehicle’s data. After attaching to a diagnostic connector, it will retrieve reports that show fault areas. That makes it reliable for the repair and maintenance process. Furthermore, the ability to connect directly using USB reduces the amount of time needed for reprogramming. 6-pin/9-pin Y-adapter for heavy-duty vehicles and a companion guide. That’s all you need. Your only task is to get a compatible software and you’ll be good to go. This scan tool is one of the most practical in the diagnosis and repair of heavy-duty vehicles. Complementing the Bluetooth module is the scanner’s portable design. It measures 12.2 x 8.5 x 4.7 inches and weighs just 3.62 pounds. So if the wireless connection doesn’t encourage you to move around perhaps the portable size will. 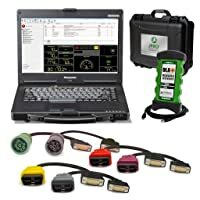 Compatible with wide variety of software for heavy-duty vehicle diagnostics. Supports virtually all protocols of heavy-duty vehicles. Can also diagnose most lightweight vehicles including Chrysler, GM and Ford models. It is just an interface (a hardware kit) that requires software to work. Not a plug-and-play device, you need to use a computer to install the software first before use. Compatibility: All heavy duty diagnostic protocols. Functionality: Toolkit and software combo. *Better than Nexiq USB Link 2 if you don’t fancy shopping around for software. Functionality: Toolkit and built-in software for complete diagnostics. *Better than Nexiq USB Link 2 due to built-in software. The Nexiq USB Link 2 is by no means a complicated scan tool. 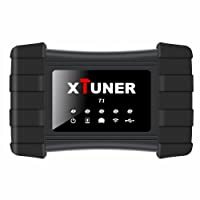 It connects to a truck’s onboard systems and a PC with ease. Plus it comes with a comprehensive user guide to help you along the way. However, its wide functionality and the fact that it has no interface of its own makes this scan tool one for the experienced. It is ideal for professional truck mechanics and DIYers who have sufficient knowledge of truck diagnostics. Otherwise, if you’re a beginner or ordinary car owner you might find it pretty complicated to use. Unless you’re completely new to this whole diagnostics thing, I strongly recommend getting this unit. It is well-priced – more affordable than heavy-duty scan tools that have their own interface and software. More importantly, the scanner is fast and compatible with tons of vehicle models and protocols. It’s almost certain that nobody will bring you a truck that it can’t diagnose. Autophix OM121 is an excellent entry-level diagnostic tool. It offers you the opportunity to quickly diagnose the check engine light.